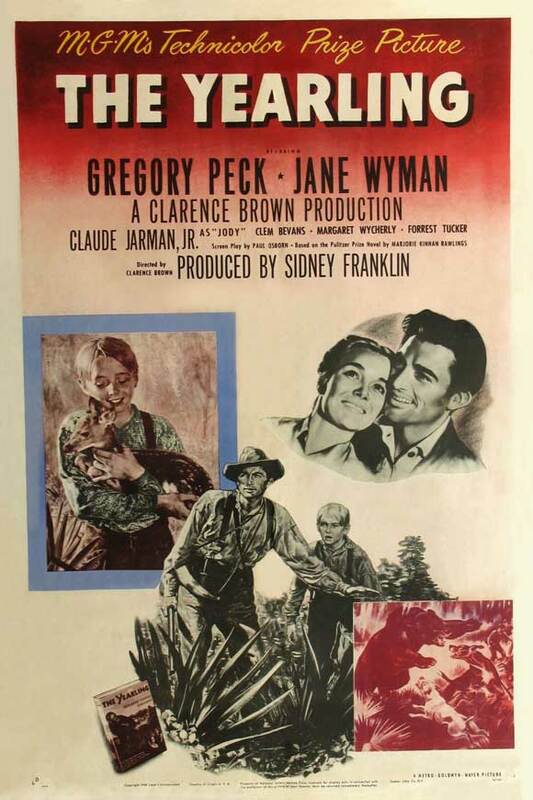 A young boy (Claude Jarman, Jr.) living with his grieving mother (Jane Wyman) and overworked father (Gregory Peck) in backwoods Florida longs for a wild pet, and is finally allowed to adopt a fawn he names Flag — but when Flag gets older, his natural tendency to graze on crops puts the family’s livelihood at stake. 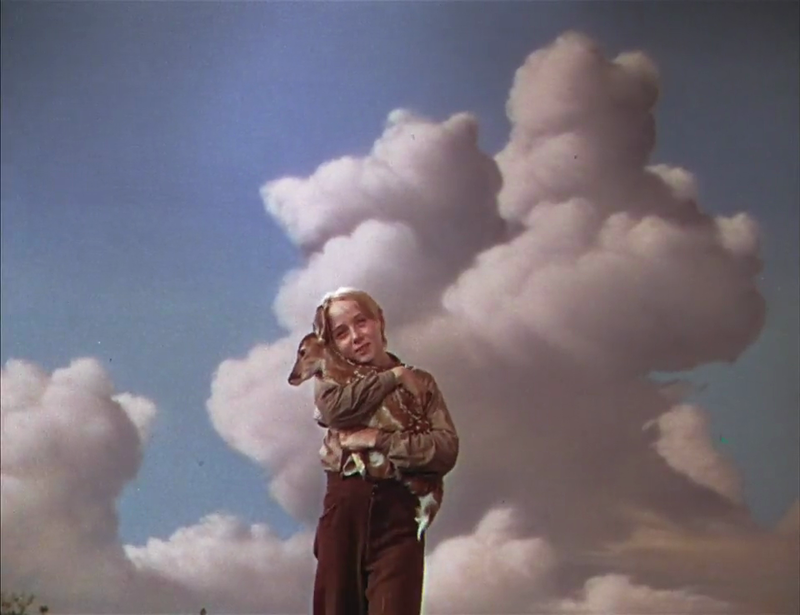 MGM’s Technicolor adaptation of Marjorie Kinnan Rawlings’ best-selling, Pulitzer-Prize winning 1938 novel could have looked much different: back in 1940, it was being helmed by Victor Fleming and starred Spencer Tracy, but “after only three weeks, the cast and crew returned to Hollywood” and the project was shelved until after WWII, when director Clarence Brown took over and a new cast of humans and animals was slated. 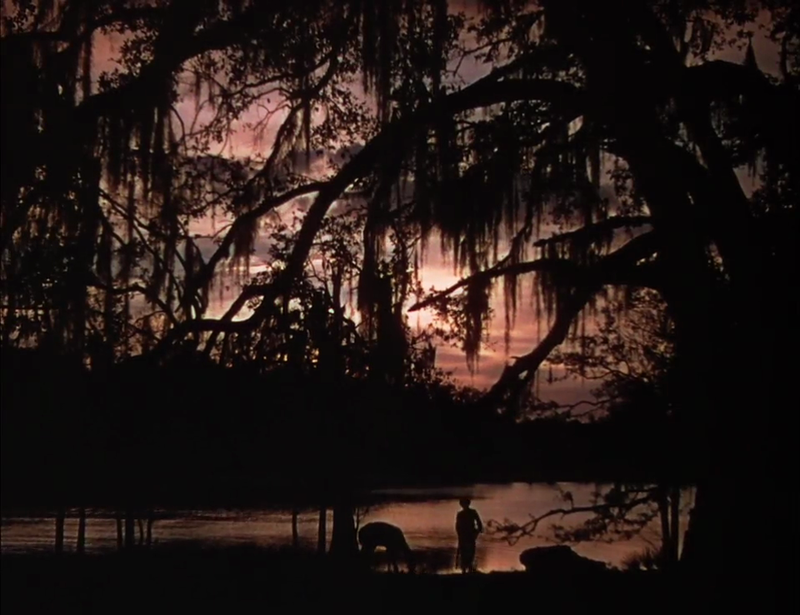 The result is a surprisingly non-cloying studio picture featuring excellent use of on-location shooting in Florida’s Ocala National Forest and a stand-out performance by unknown Claude Jarman, Jr. — found “in his Nashville, Tennessee elementary school” — as young Jody. 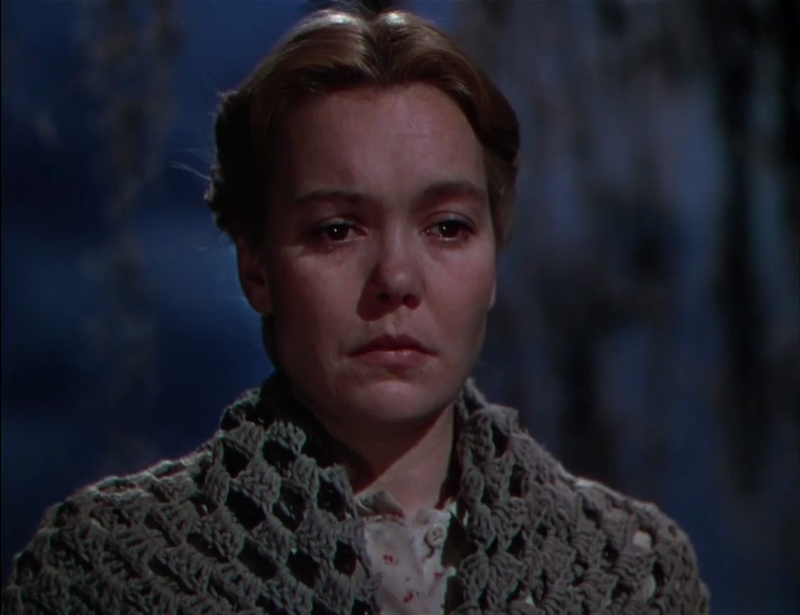 Equally noteworthy is Oscar-nominated Wyman, playing a woman whose previous children (six in the original novel) all died, and who epitomizes the harsh reality of survival in 1870s backwoods Florida. She struggles to find much to celebrate in her challenging existence, and her rare smiles are notable — yet she achieves the near-impossible in making viewers sympathize with her stance even as we (naturally) feel most invested in Jody’s coming-of-age dilemma. During the ten months of filming, 32 trained animals were used, including five fawns. The fawns needed to be replaced as they aged in order to conform to the description of the title animal. The fawn found by Jody, as he pulls back the foliage, was three days old and had been rescued from a forest fire. Other animals used in filming included 126 deer, 9 black bears, 37 dogs, 53 wild birds, 17 buzzards, 1 owl, 83 chickens, 36 pigs, 8 rattlesnakes, 18 squirrels, 4 horses & 17 raccoons. The quantity of “critters” total is 441. Yes, once, as a fine children’s classic. 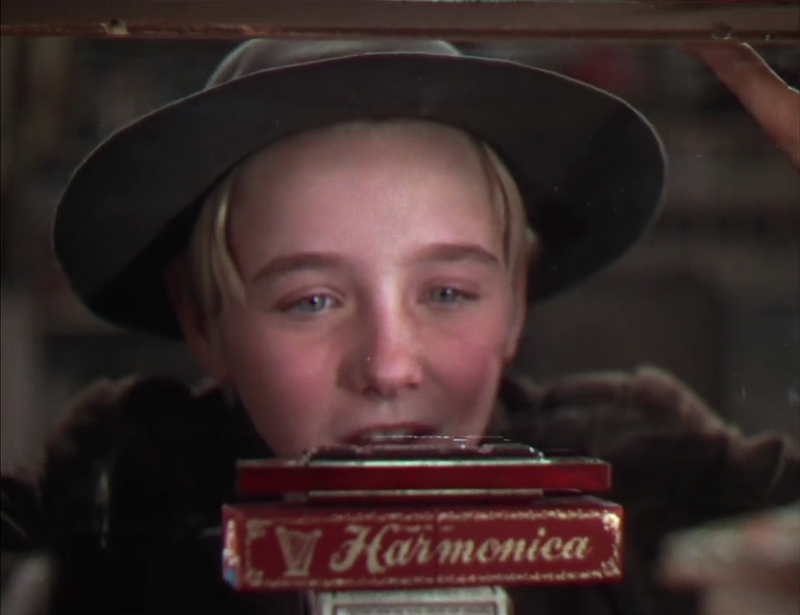 Far be it from me to fly in the face of what is clearly a much-beloved classic (book and/or film) but, for a number of reasons, I find the story to be too much. 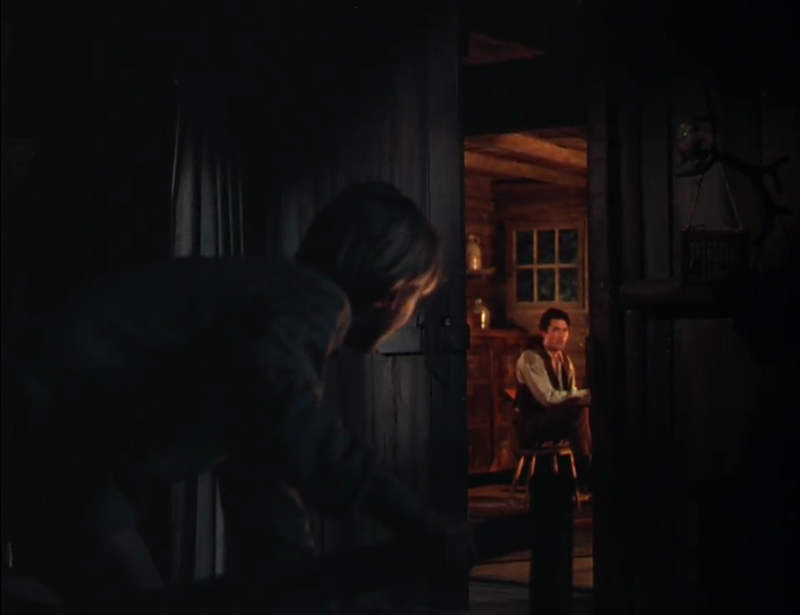 I haven’t read the book but the translation to screen – though it has some fine sequences – leans toward being (by turns) a bit too sentimentalized and overdone. – The mother is (for the bulk of the story) so removed from her family and herself emotionally that, even though her behavior has a valid explanation, it seems extreme… and set firmly for the purpose of maintaining a conflict that the story would otherwise sink without. – The parents (experienced farmers) allow their child to keep for a pet the kind of animal that they (should) know will be destructive to their crops (which they desperately need for survival). Worse, the deer destroys the crops several times (!) before a decision is made re: what to do with it. 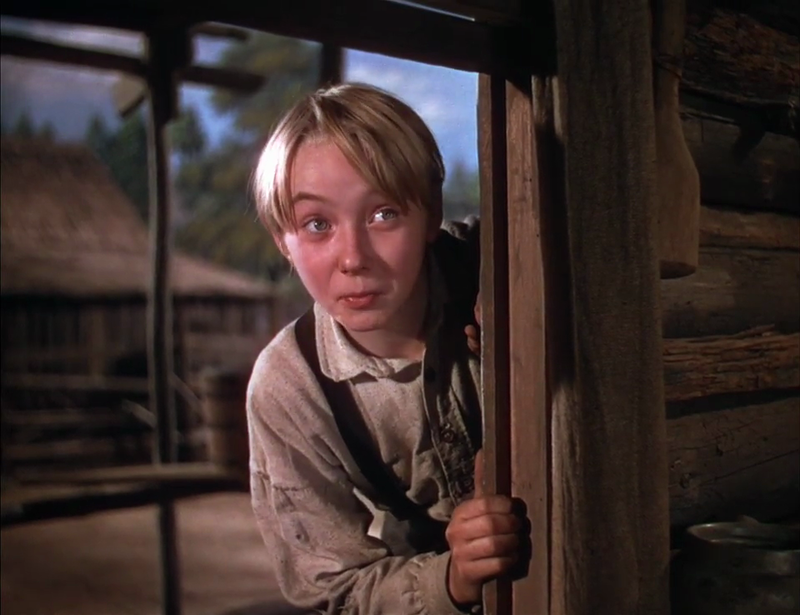 – The film ends up going to a place that is much darker than ‘Bambi’! It becomes bizarre when the father commands his son to ‘resolve the issue’. 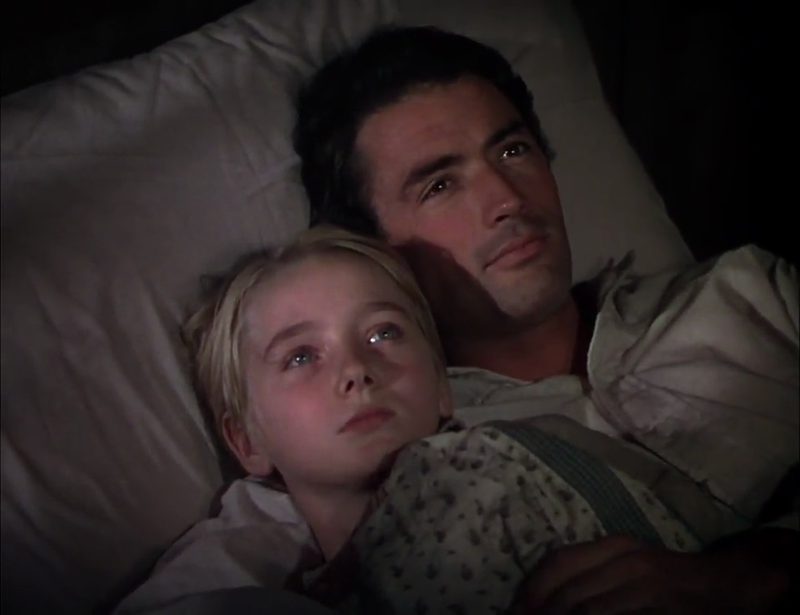 That said… as I mentioned, there are some scenes that I do think are effective, particularly Peck’s speech to his son right near the film’s end: it’s compassionate, sensitive and sensible (and we can see from it how Peck would eventually become Atticus Finch).